Mr. Danny Rainer and Mr. Alexander Blonsky, Vice-President and representative of the foundation in the UK respectively, have participated in an international telelink sponsored by Novosti Ria News Agency, Accu Radio and the Izvestia Magazine. Together with the IRWF representatives in the Jerusalem studio was Member of the Knesset, Dr. Marina Solodkin, who campaigns for Raoul Wallenberg and tries to promote a Law of Remembrance to the Rescuers. In the Moscow studio were Anatoly Prokopenko, former chairman of the Special Section of the State Central Archives of USSR; Ilia Altman, Director of the society ”Holocaust”. The title of the session was ”Raoul Wallenberg’s fate” and the parties agree that more needs to be done in order to ascertain the fate and whereabouts of the Swedish hero. Mr. Rainer pointed-out that ”the IRWF is not engaged in finger-pointing, not looking for culprits…the important thing is to bring closure to this human tragedy. If Raoul Wallenberg is dead, he deserves to rest next to his parents and brother (Professor Guy von Dardel, who passed away a few months ago)”. The link to the teleconference is the following. Transciption of the televised session. Good day dear colleagues. Today we will talk about RW affair. Our meeting is taking place within the framework of the series ”Careful – History” and this project is organized jointly with the radio station ”Echo of Moscow” and ”newspaper ”Izvestia”. The series is aimed to attract attention the hot topics of the Russian history. 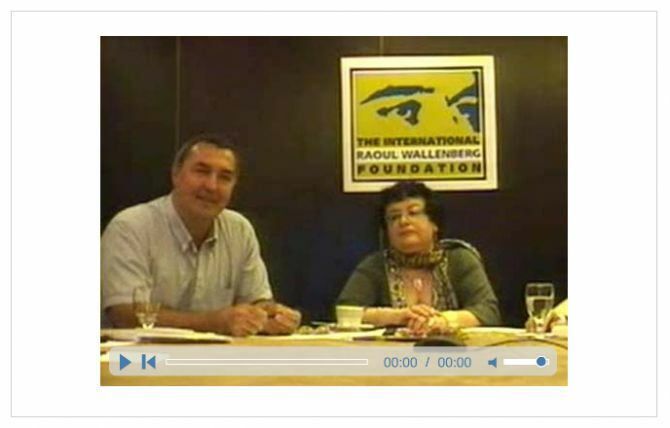 So, the mystery of the Swedish diplomat RW who had disappeared in the former Soviet Union, is still unresolved, and today the participants of the Russian-Israel video-link will discuss how far the investigation of the mystery has progressed. I am pleased to introduce our participants of the discussion. It is a historian, archivist and a former director of the Special Archive and presently the Central Archive of the Document Collections Prokopenko Anatoly, and also the co-Chairman of the historic and educational society ”Holocaust” Ilia Altman. And please, can you introduce the participants on the Jerusalem side. The Jerusalem side is represented by Knesset Deputy Marina Solodkina, who has been closely involved and is very competent in the RW affair, Danny Rainer – the Director of the Israel office of IRWF, and Alexander Blonsky from IRWF. Thank you and let’s give the floor to your side. Good day and thank you. We are very happy to have this discussion with Moscow together with RIA News and ”Echo Moscow” radio, both of which enjoy our respect. I got involved into the RW case a while ago. I have been a member of Knesset for 14 years for the 5th term now, and my main area has been dealing with the social problems of the Israeli survivors of concentration camps and ghettoes in the WW2. About 8 years ago I received from my then colleagues – at the time I was in ruling party Likud, and now I am in opposition party Kadima – a draft of the law proposing to introduce the name of RW into the calendar of Israel holidays – there a quite a few dates which are celebrated in Israel, for example we the former Soviet Jews have been celebrating the Victory Day of WW2 for the last 10 years, which was introduced by myself and my colleagues. The law on RW is very logical and rational, and the idea is that the Jewish people are very grateful to the Righteous who helped greatly in the salvation of Jews. Every Jewish family which survived the German occupation has its own Righteous, and the day should be introduced to celebrate the Righteous, and we do celebrate them, but in conjunction with the Holocaust. And we think that RW is the perfect representative of the all the Righteous because he had saved tens of thousands of Jews in Hungary, and he himself became the victim of political repressions of the Stalin’s regime. In this connection I proposed to mark RW’s birthday 4th August – he will be 100 years old in 2012 and I hope that we in the Knesset will widely mark this date, and I have a lot of colleagues in Knesset who share my views and we have already started preparing for this date – and this proposal, for certain reasons, cannot get through. I have put it for vote twice, and on both occasions the joint committee of the Ministers did not consider it possible for RW’s birthday to coincide with the Day of Righteous. There are other proposals, for example some propose to mark 17th January – the day of RW disappearance. I think I will have to give a chance to speak now to my colleagues, and I will be happy to answer the questions. I am an archivist first and historian second, and that’s why the story of mysterious disappearance of RW in the Soviet Union has interested me mostly in terms of documented truth. First of all, I would like to prove, on this and other examples, that the state secret which covered everything in the Soviet Union, is a terrible thing for the state itself, for the society and for each individual, and covering up any truth, whatever it is, keeps coming like a boomerang with tragic consequences for the state, for the society and for each individual. There is no need to discuss the humanitarian activity of RW, it is an absolutely proven fact, and even if it was not tens of thousands of people, but one, ten, hundred individuals, each live is valuable. The thin is that the lies about RW started right after his arrest, in January 1945, as was mentioned before. Whether he was arrested, or he came to the Soviet zone himself with his driver, is difficult to prove with documents, because, as an archivist I can say that the official documents on official letterheads with official stamps were often falsified in the Soviet Union. I think that he was indeed arrested. And I have to say that his fate remained in the vision of the Swedish authorities, they immediately inquired the Soviet authorities where he had disappeared, even more so that he was not an enemy, he was a peace maker, and if anything had to be discussed with him there was no need to arrest him, rather he should have been invited as a guest of honor to tell about his humanitarian mission, but as you know the Soviets had everybody was under suspicion then and the arrest was like an integral part of the Soviet society. The lies started from the moment when in reply to the Swedish requests, and this has been proven by numerous documents found by the Russian-Swedish working group, the Soviets invariably replied that they had no information about him and they ”would look and may be would find something”. And further on, the first mention in February 1957 of the notorious Gromyko’s memorandum where it was for the first time admitted that he had died in 1947 after heart attack and it had been documented in the medical report of MVD doctor Smoltsov – this is remarkable because it was the first instance when the lie of the Soviet Government in RW affair was officially documented. Until then the Soviet position was vague, and this was the first admission that he had been in Soviet prison. And the methods of our law enforcement agencies had always been the same, with small variations. In the same way for example, the Japanese used to keep asking about the fate of the 60 thousand Japanese POW, and our government always used to answer – we don’t know – until documents were found that they all died here. When the Russian-Swedish Commission was set up, I was then in charge of the Special Archive, it was called also Secret Archive, of the Central State Archive of the USSR, and the members of the Commission came to me – the now Director of the society ”Memorial” Arsenii Raginsky and Bernstein who now lives in the USA, and we started, right in my office – hundreds of files had been brought in my office from the Political Section of the Department of POWs which was the most secret and most valuable archive – and in my office Raginsky and Bernstein started looking virtually through every page of every file. As an archivist I can tell you that this is the only way, in the vast ocean of documents, you can find anything, and not just to ask somebody to find something and maybe they will find something – it only has to be direct independent search. And virtually on the 5th or 6th day they found a document about transfer of RW in February from Lefortovo prison to Lubianka – this was the first official real document found – confirming that yes, he was here in the Soviet Union, and not as guest of honor but in prison. Several days later another document was found that his driver Langfelder was kept in the same prison. After that the events developed the following way. Raginsky and Bernstein, happy with the discovery, told the members of the Commission about it. And as you know the Commission included people from the KGB, as it was called then. And I am saying directly, that virtually 2-3 days later I received an instruction – to put the further detailed examination of these files on hold, and so this work was wound down, and I can say that even to this day this archive No. 451 has not been examined by page, even though it contains many hundreds of files. You have to understand that the KGB in those days still was very strong, and I could not resist that system and carry on with the search. This is the first point. Later, a Commission of the Supreme Soviet of Russia was set up with Ruslan Hasbulatov in charge, and with famous human rights activist Sergei Kovalev among its members, he was in charge of the Commission for rehabilitation of the victims of political repressions at the time. Eltsin issued 2 decrees then – about nationalization of the archives of the Communist Party Central Committee and KGB, so this Commission set up a working group was set up to study the KGB archives, and I was appointed Chairman of this working group. To assist me I took the same Raginsky and now famous historians Nikita Petrov and Nikita Okhotin. And this brief period, about a year and half, was a happy time when we were the first to be able to examine the archives of the KGB. We thought that the archives were never in Moscow, that they were all over the huge territory of Russia in different cities. And at some time I came across a very thick file of around 400 pages – the case of Tolstoy-Kutuzov who was a descendant from a very famous family, and who in the 20’s was recruited by Soviet secret services. I looked through every page of this file, being constantly distracted to do my other duties as the chairman, and I came across RW name many times in this file and my impression was that they were the reports of RW’s activity in Budapest. And this is the second specific document. No other documents have been found. Once a famous writer Lev Besymensky came to me, and he and I, as I had certain authority at the time, went to the archives of KGB and Foreign Ministry, and there we saw a curious thing in the registers, namely that a message was sent from the then Deputy Foreign Minister Vyshinsky to Abakumov, the then Chairman of KGB dated at beginning of July 1947, with a request to clarify what and how should be said about RW. It is stated in the KGB register, that the reply to this request was prepared by KGB and sent to Molotov, and it is marked that this document was received, but the letter itself is not available to the researchers. It could not go missing, it is just that even to this day in spite of the claims of the current officials of the state archives, there are still masses of secret documents, which they are not willing to open up. It is this document which, both in my and in Bezymensky’s opinions, has the information about why he was said to have a heart attack and died. We think that it laid down the reasons why it could not become known why RW was killed. Unfortunately, this letter is not available today and probably never will be. We know that the Israeli side was also involved in the search of the documents, and about a year ago a number of documents were passed by the Russian side to the Israel authorities, and Marina Solodkina was involved in the search. I want to thank Anatoly Prokopenko for his work, I can see a real archive professional there. I myself am not involved in the RW case itself, I am engaged in the preserving his memory because for us RW is a collective savior. My family in the Ukraine was saved by a Ukrainian woman, Sasha Polischuk, and every one of us has own savior, but for all of us RW represents the ultimate savior. When I started looking through the cases, and after my draft laws, which had not passed, were published, I started receiving information from people, and one thing attracted my attention, which has not been covered in Soviet historiography at all and is understood in the West not in the right way. Namely, and Swedish delegation came to Moscow in 1946, and they had a meeting with Stalin, and I was told about it by people who participated in the work of Russian-Swedish Commission as mentioned by Anatoly Prokopenko before. During this meeting a proposal was made by the Soviet side, may be by Stalin himself, to exchange the prisoners. Stalin proposed to swap RW for a woman doctor who defected from a Soviet ship, and 8 Soviet military personnel who defected in Konigsberg. As was reported by the English sources, this Stalin’s proposal was not properly understood by the Swedes who were mislead by the Soviets and accepted that RW had been killed by the Hungarian fascists when he was going to the meeting with the Soviet military. May be Swedish naively could not comprehend that the Swedish diplomat could be arrested, and how he, the figure of such status and the savior of many thousands of people during the war, could be used to swap for other people. I can only suggest as a hypothesis, that when Stalin saw that Swedish refused to swap RW, he concluded that he had no value and could be killed. The people who told me about this, said that they found no records of that meeting between Stalin and Swedish diplomats and they think the records gone missing, but I think that we are from the country where they said that ”manuscripts don’t burn”, no doubt they will be found. I represent the IRWF which was set up in the 90’s, one of its founders was Baruch Tenembaum, a well known public figure, who was put forward for the Nobel Peace Prize on 2009, along with Barak Obama. The fund has among its members many prominent public figures, Nobel Prize winners, heads of states, governors etc. The fund has 2 objectives – the person of RW is of colossal statue, and aim of the fund is to preserve and promote his legacy and his values, creation of cultural and educational programs. The 2nd aim of the fund is the fate of RW, which still remains one of the biggest mysteries of the 20th century and triggers a great amount of human interest, and people will not be satisfied until specific and truthful answers are received about what exactly happened to him and a full stop will be put in this affair. The fund is not a political organization and is not looking to lay the blame, but it is consistent in its efforts to find the answers. The name of RW and what he did is not widely known in Russia these days. Regarding what he did – he was sent to Budapest in 1944 as a Swedish diplomat with the task to save Hungarian Jews from extermination by Nazis. He used to issue Swedish documents to Jews and in this way he saved up to one hundred thousand people from death. He worked under constant threat to his life, he met Eichman several times, and when German troops were leaving Budapest and they had orders to liquidate the Jewish ghetto and kill all the remaining Jews, RW met the German general in charge and, by threatening to testify against him as a war criminal, he persuaded him not to carry out the order, thereby saving many more thousands lives. The fund’s objectives also include finding other saviors who remained unknown. There were many people during the war that saved lives, but they are all heroes and deserve to be honored for what they did. This is briefly about the fund. I have a question to Anatoly Prokopenko, who worked directly with the state archives and has a firsthand knowledge of the system. One would think that with the fall and disintegration of the Soviet Union, when everything was turned inside out, all the people from the old system are gone, and all the state figures who were somehow involved in this case are all dead – what do you think is the reason and the rational for this case still to be kept secret? RW had a certain value for the Soviets, and they wanted to gain a lot from him. First of all one should remember that he was coming from a hugely wealthy financial dynasty, and I cannot exclude that the Soviets wanted to recruit him to their side, namely in the postwar reconstruction he would be some kind of link between the USSR. Also, it is a known fact that Stalin was preparing a new round of show trials, against the world imperialist and Zionism, and he hope to have RW as a witness who would play on his side. I think, this is the main thing. I have also to say that the Soviet secret services were suspicious of anybody who worked with other secret services. In this connection I have to mention about the archives of the French secret services Surte – Germans got them first, and then Soviets took them from Germans, and later they were passed back to the French. And it was found, that a huge number of Soviet secret agents in France worked for other secret services, were double and triple agents. Why, it is another question. And as you rightly said, RW had to contact German authorities in the course of his rescue work. And that made his suspicious in the eyes of KGB. But we know that many cases of the Soviet secret intelligence agents have not been opened up. Why is the RW case still closed? You know, some time ago I met 2 KGB investigators who spent tens and hundreds of hours interrogating RW, and they wrote masses of protocols from these interrogations, during which they asked RW many questions from the Soviet government of political, economic and other nature. And RW’s answers were there as well. RW became a carrier of secret intentions of the Soviet authorities in the political, economic, military and other areas. Naturally, they could not leave him alive after that. I asked these investigators ”You used to interrogate him, where are all the protocols?” Well, they were of advanced age, their names were Kopeliansky and Solovov, they are probably dead now, and they used to answer me ”we remember everything, but about RW we remember nothing”. And I used to tell them ”OK, the Soviet power is gone, let me ask Eltsin for a permission for you to speak up”, but they used to say ”we know no Wallenberg”. So, I think that during these interrogations he became privy to the secret information of state importance. Thank you Mr. Blonsky for this question. Unfortunately we have no one here with the authority to open all these documents. But let me take a layman’s view – I have the impression that there has been no progress in this affair. It still is as mysterious as it was in 1945. Mr. Prokopenko put forward a theory that RW was a carrier of some hugely important global information which cannot be open even now. Another reason, as to why his fate is still unknown. In the 91-92 we tried so hard to expose the KGB, that the KGB colonel Krayushkin who was in charge of the 10th section of the KGB,and with who I had to spend hundreds of hours in his office trying to work out how to make the KGB files publicly available even though I knew that that would never happen, asked me if there was a job for him in the state archives. Can you imagine, such a powerful man realized that his job is at risk, the man who responsible for allowing people to go abroad. The image of KGB was very damaged then in the eyes of people, but soon after that it started recovering, thanks to the efforts of the then authorities, and now with the present one continuing, and FSB is viewed as the heirs of KGB. And can you imagine, that now all this mass of documents – and they have not been destroyed, I can guarantee that as a professional (54.40) – is opened up and it becomes public knowledge that KGB suffered a terrible failure in recruiting RW, and that he was killed – and there is certain indirect evidence to that, possibly poisoned – they (KGB) have to be mad to admit that this has been done by their predecessors. The confidentiality laws provide 75 year secrecy period for the documents which may damage the state, and that is why we cannot use the documents from the trials of the German collaborators, although I must say that occasionally we do get help from the FSB central archives officials. And I would like to stress one thing – we have to decide with our colleagues from Israel on the way to move this case forward. It is very important to clearly define the directions of the search which have not been followed before. One of them is around RW’s activity in Budapest and his negotiations with the Nazis, and the second one is all the documents which are always created in similar situations. Unfortunately our staff in the centre ”Memorial” are not professional archivists, and one has to know exactly what and how to request from the archive staff of KGB. When I was looking through the documents of KGB, I could not help admiring the level of documentation there – such a perfect state of documentation does not exist in any other archive, even the Central State Archives. Even if a document has been destroyed, there is a record in the register when and how it was destroyed. But the thing is if we start making requests to somebody to provide information, all we will receive will be these standard replies. And our laws are such that even the state prosecutors cannot have direct access to the KGB archives. You have to make a request and we will provide the documents, and the answer from behind the closed doors is always the same – we do not have these documents. And the last thing, as an example of how the documents are hidden. I knew Guy Von Dardel very well, he came here and we talked to him a lot, and he used to say ”what else can we do, there are lots of documents and it always comes to a dead end”. And I told him ”Why don’t you go directly to the KGB archives and ask them for the File of Tolstoy-Kutusov?”, the same one I saw once, ”you will find a lot about what he was doing in Budapest”. When he came to KGB they told him that they did not have such a file. He told them that the famous archivist Anatoly Prokopenko had seen this file. OK, they told him, you have to wait for several days. Several days later he was invited back. He is a serious man, but when he came back to the hotel he was laughing. ”Why did you tell me there is a lot in that file? There is nothing there, they gave me a very thin file”, so during these several days they took out everything relevant out of there and gave him just papers. So, as I understand it, in 50 or 75 years these documents will be opened up, and they are still there. Absolutely, I have no doubt about that. I would like to ask all the participants in Jerusalem how high is the interest to this case in Israel and the world, and whether it can be pursued at the government level, in particular in the Russian-Israeli dialog. You know that I am in opposition now and cannot speak for the government, but I can say that there are people in the Prime Minister office who are in touch with me on this subject, because it interests a lot of people from very different levels of Israeli society, and we have a religious group in Israel for who unburied hero is the same as unfinished WW2, and there should not be missing people without graves. Recently the day of RW’s arrest was marked in the Knesset, and I could see that this case is of interest to the politicians from various political directions, and I have also to note that we, the former Soviet Jews, view it as our obligation that the country we were born, resolved this issue, and I feel the support of the one million strong former Soviet Jews community. Regarding the political side and its inclusion into the negotiations I think it is possible. I have to say I am pessimistic regarding the Russian society. I have asked many young people who RW was, and they only shrug their shoulders. And this, while in the other countries there are his monuments and streets named after him, and in Russian there is just one bust in the library, which was put there by people with conscience and not by the state, can say a lot about the attitude to RW fate. That is why this subject cannot be closed in Russia either, and I think that both the state and the public have to be kept aware. A proposal should be made to our president and the government, and lay down the points, and these points are very simple – to find out what happened to RW, without trying to find somebody to blame, so that his relatives knew about him. There must be a political will of the president to set up a commission from independent experts, including Altman, and, if you allow, myself, because without the detailed research of the archives of the KGB, MVD, Foreign Ministry, Ministry of Defense we will never find the truth about RW. I want to mention that the UN resolution about the international day of the memory of the Holocaust victims, which was also signed by Russia, provides for the archives connected with Holocaust to be open up. That is why the case of RW is an illustration of how in Russia a huge mass of documents connected with Holocaust is still beyond the reach of researchers. I also would like to mention about the wrong direction in the previous efforts which gave an excuse to our opponents not to allow the researchers into archives. The main emphasis, of the Swedish side and some others, was made on the assumption that RW was alive, he was seen, and documents should be produced to confirm that. I and my colleague here are of the same opinion, that the document about his death could not have been falsified, the reason may have been wrong, but the death itself could not have been falsified – there have never been cases when somebody’s death in Lubyanka was falsified. People who died there, are all buried at Donskoe cemetery, and the place is known, so let’s define our objectives and not repeat the mistakes which have already been made. Thank you. Next article: Raoul Wallenberg was Prisoner Nr. 7 !! !